POLE POSITIONS The devastation from last year’s fire has many pointing fingers at PG&E’s maintenance of vegetation around its power lines. As he sets out to rebuild the North Bay after the October wildfires, Sonoma County developer, newspaper investor and regional Democratic Party power broker Darius Anderson is now lobbying in Sacramento on behalf of Pacific Gas & Electric interests. According to the California Secretary of State, Anderson’s lobbying firm, Platinum Advisors, was hired by the utility on March 28—just as a Senate bill that’s targeted at PG&E’s fire liability was scheduled to make its way through the committee process. Co-sponsored by North Bay pols Bill Dodd and Mike McGuire, SB 819 sets out to limit the extent to which electric utilities can pass off legal fees and fines to ratepayers. The current regulations prohibit gas corporations from “recovering any fine or penalty in any rate approved by the commission,” and SB 819 extends the prohibition to investor-owned gas and electric corporations such as San Francisco–based PG&E, which provides power to some 16 million California residents and is the dominant investor-owned utility in the state. Senate Bill 819 would seem designed to head off the utility’s attempt to convince Sacramento regulators and lawmakers that fallout from the “new normal” of climate change and wildfires shouldn’t fall on the utility, even if its equipment is determined to be a culprit. Two state agencies are investigating the historic blaze that swept through the region last October, and no final official determination has been made about PG&E’s ultimate responsibility for the fires. The bill unanimously passed the Senate’s Energy, Utilities and Communications committee last week and was headed for another hearing with the Judiciary Committee this week. Sen. McGuire is a member of the former committee. His office did not respond to a request for comment on Platinum Advisors or Anderson’s new role lobbying for PG&E. Like many elected California officials, McGuire has been a recipient of PG&E campaign funds. Platinum Advisors was founded by Anderson, a Sonoma resident who is also a principal investor at the Sonoma Media Group, which owns the Press Democrat and several other publications around the region. He’s also the founder of the Rebuild Northbay Foundation, a nonprofit he created after the fires. It is registered as both a 501(c)3 and 501(c)4, which means that Rebuild Northbay can act as a charitable nonprofit organization and as a lobbying group. The 501(c)(4) designation is for “social welfare organizations,” which can endorse political candidates; 501(c)(3) nonprofits are restricted from influencing legislation and can’t participate in campaign activities for or against candidates. The Rebuild Northbay Foundation’s board members include Steven Malnight, currently a senior vice president at PG&E. According to the Rebuild website, Malnight until recently served as PG&E’s senior vice president for regulatory affairs, “where he oversaw PG&E’s regulatory policy efforts at the national and state levels, including interactions with the California Public Utilities Commission (CPUC).” Paulo did not respond to a follow-up email inquiring about Malnight’s role as a PG&E employee who is also a board member at Rebuild Northbay. The utility has come under intense scrutiny following the wildfires last fall, as state investigators set out to determine what caused the fires that destroyed nearly 9,000 homes and buildings, killed more than 40 people and prompted hundreds of lawsuits against the utility—including a suit by Sonoma County itself. At last count, Sonoma County faced a $2.2 million budget deficit because of the fires, and sued PG&E in February. County Counsel Bruce Goldstein told the Press Democrat that the county hoped to recover between $9 million and $25 million in county funds spent on the cleanup and overtime pay. As he announced the lawsuit against PG&E in early February, James Gore, chairman of the Sonoma County Board of Supervisors, told the San Francisco Chronicle that the county sued the company with reluctance, and that PG&E were “great partners” for the county. Gore’s wife, Elizabeth, is chair of the Rebuild Northbay Foundation, whose founder is now lobbying for PG&E’s interests in Sacramento. James Gore did not return a call for comment. Noreen Evans, the Santa Rosa lawyer who lost to the Press Democrat–endorsed Lynda Hopkins in the 2016 5th district Sonoma County supervisors race, apparently doesn’t see much in the way of a “good partner” in PG&E. Responding to PG&E’s mid-March superior court pushback to fire-related lawsuits, she told the Press Democrat that “PG&E wants to increase your utility bill to pay for burning your home.” Evans is representing local plaintiffs who are suing the utility. Anderson’s new deal with PG&E comes as the developer has for-profit business before Sonoma County this week through his firm Kenwood Investments. Tuesday the Sonoma County Board of Supervisors approved Anderson’s plan to build out his Wing & Barrel Ranch, an upper-crust shooting club in the Sonoma baylands whose splashy plans come complete with a restaurant, a fishing pond, an 18,000-square-foot clubhouse, and a new 85-foot shooting tower nestled among a field dotted with 250-foot PG&E towers. As part of an agreement with the county, Kenwood Investments agreed to knock one story off the proposed three-story clubhouse, set aside a couple days a week for hunters of lesser means and cap club membership at 500, including 25 corporate memberships of three-persons each. The proposal was conditionally approved in 2012. According to Wing & Barrel promotional materials, those memberships are $75,000 a year for individuals, and $145,000 for corporations to enjoy the Charlie Palmer menu and premium cigars. Anderson did not respond to an email seeking comment, and a call to Platinum Advisors was not returned. Does PG&E plan to purchase a corporate membership at Anderson’s new venture? Has Wing & Barrel sent its marketing materials to the company’s investors? Paulo did not respond to a follow-up inquiry which sought to answer these questions. The North Bay fires caused an estimated $9 billion in insured damage, and many residents hold the utility directly responsible for their losses. Numerous press reports have noted that PG&E carries about $800 million in liability insurance. The upshot is that the investor-owned utility may be facing one of the more severe existential crises in its hundred-plus-year history, and issued a statement in January which, even as it didn’t oppose it, argued that SB 819 could not have come at a worse time for the utility or its ratepayers—given its commitment to participating in the state’s climate-change reduction strategies. 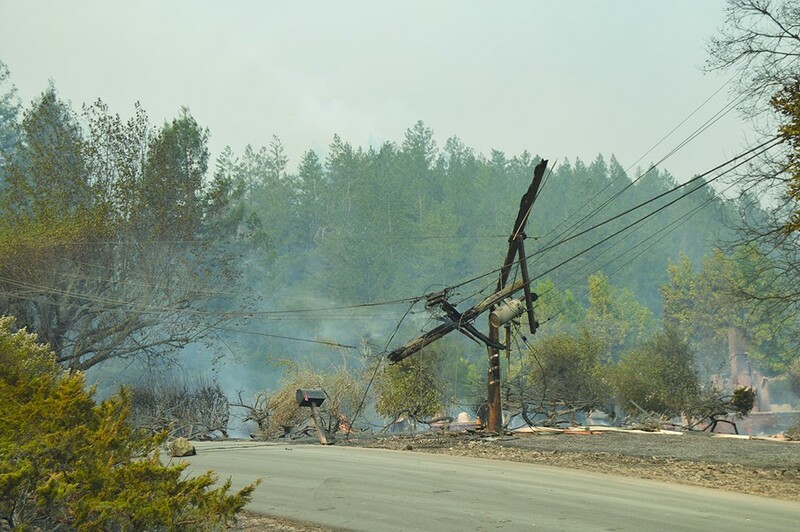 Since the fires, PG&E has embarked on a vigorous public-relations campaign to assure ratepayers that it’s on top of its responsibilities to clear vegetation from around power lines. Some suspect the fires began with sparks from wind-whipped power lines that ignited nearby trees. The utility participates in the region’s clean power initiative (Sonoma Clean Power) and has extensive ties in the county, some of which are reflected through its community investment program. In 2015, for example, the utility donated $2,500 to the nonprofit Children’s Museum of Sonoma County; it also displayed a hydroelectric model in the facility as the museum was getting off the ground. Leslie Horak, one of the founding members of the museum, works as a communications specialist with PG&E and manages its college-scholarship program. The museum was not damaged by the October wildfires. As wildfire suits mounted late last year, PG&E put the heavyweight Sacramento lobbying group Capitol Advocacy on its payroll as of Jan. 1 of this year. It added more lobbying firepower with the addition of Platinum Advisors about three months later. That strategy appears to be: hold the line at any attempt to hold the company liable for damages in the fires; enhance local partnerships with deep-pocket developers; and serve the interests of investors in the process. At the time of the fires, PG&E shares were trading for about $70; by early February, the stock had bottomed out at $38 a share, and has slowly crept back to $45 a share as of late April. The company reported $17.14 billion in revenue in 2017 and announced late last year that it would suspend dividend payouts to investors in 2018, given the uncertainty over its liability for the fires. By the middle of March, the utility had taken its case to court and submitted multiple findings in state superior court pushing back against the mounting lawsuits. At issue for PG&E is the principle of “inverse condemnation,” whereby California says the utility can be held liable for damages from a wildfire, as PG&E argued in a press release on Jan. 3, “even if the utility has followed established inspection and safety rules.” The utility had been negotiating with the state Public Utilities Commission over extant regulations right up until the fires broke out in early October. The commission has historically been taken to task for its too-cozy relationship with the utility and its Wall Street backers, but did announce after the fires that it was launching an investigation of its own and told the utility to preserve all its emails and documents. Correction and clarification: an earlier version of this story incorrectly stated that Kerns' husband is a former Sonoma Supervisor; Mike Kerns is her father. Also, an earlier version stated that Hopkins was backed by Anderson. She was backed by the Press Democrat, which is co-owned by Anderson.